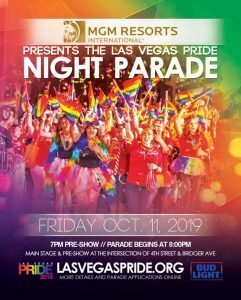 Join us in downtown Las Vegas on October 11, 2019 for the most glamorous, glittering spectacle ever created by the gay, lesbian, bisexual, and transgender community of Southern Nevada, the annual Las Vegas PRIDE Night Parade! 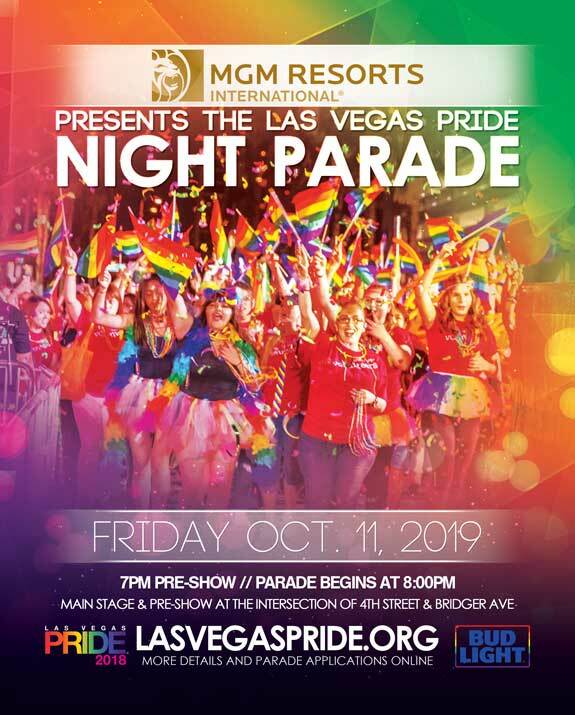 Grander than any other PRIDE parade ever held in Las Vegas, its SNAPI’s 22nd Annual PRIDE Night Parade presented by MGM Resorts International! 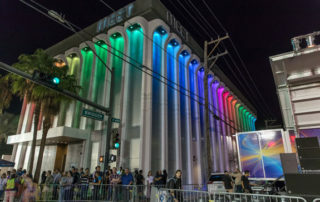 Join us in downtown Las Vegas for the most glamorous, glittering spectacle ever created by the gay, lesbian, bisexual, and transgender community of Southern Nevada. 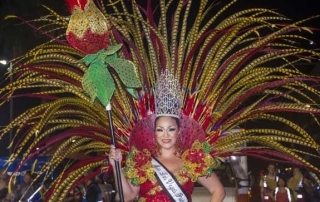 This year’s PRIDE Night Parade, led by our Parade Grand Marshal, features Las Vegas’ gay and straight business community, nonprofit organizations, GLBT service agencies, civic groups, and churches as well as SNAPI’s royalty. Don’t forget to come early to grab the best spot and pre-party with PRIDE (at the corner of 4th Street & Bridger Ave.) Then, when the parade ends, make sure to keep the party going at the official after parade party. The parade route begins at Gass Ave. and heads north along 4th Street to Ogden Avenue. 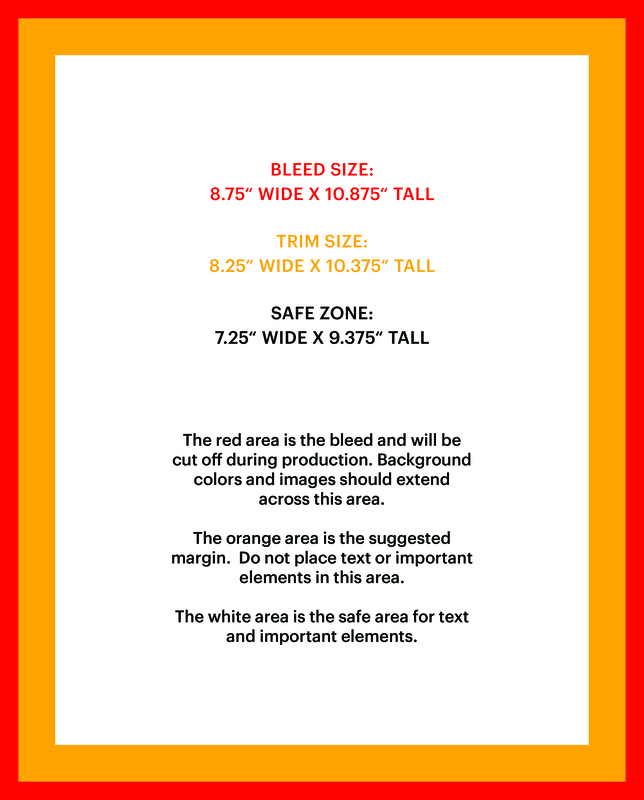 Secure your spot where the action happens early. The main stage is at Bridger Avenue just two blocks south of the Fremont Street Experience. 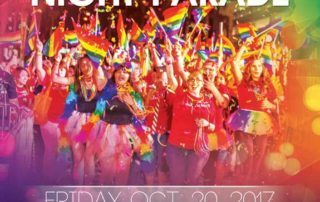 This year Cox is proud to support Southern Nevada’s GLBT community as the official broadcast partner of the PRIDE Night Parade. Party all night at the parade and catch all the fun AGAIN during one of many rebroadcasts on YURVIEW LAS VEGAS on COX 14 and 1014. There is a competition for parade entries (find the categories and judges here) vying for trophies for best walking units, vehicle units, and floats. Judging takes place at the grandstand so support your entry with thunderous applause as they strut their stuff for our celebrity judges. 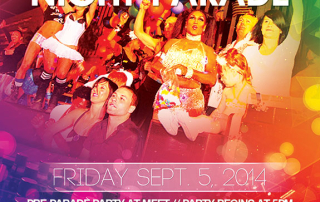 After the parade, make sure to continue the celebration at one of the official Las Vegas PRIDE Parade After Parties! The following individuals serve as members of the Parade Committee. 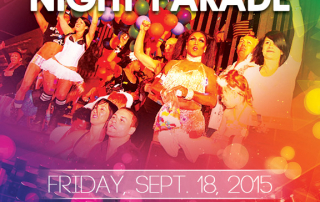 Interested in registering to participate as a contingent in the annual Las Vegas PRIDE Night Parade? Visit our Parade Application & Information page for forms available to contingents wishing to enter the parade line-up.